Callum Devine has been nominated for this year’s Motorsport Ireland Billy Coleman Young Rally Driver Award for his performances in January and February. The 21 year-old from Claudy, Co Derry, drove his Opel Adam to a class win and 16th place overall in the Donegal Stages Rally in January, and went on to take another class victory and 14th position against much stronger opposition in the Galway International Rally, the opening round of the Irish Tarmac Championship, one week later. 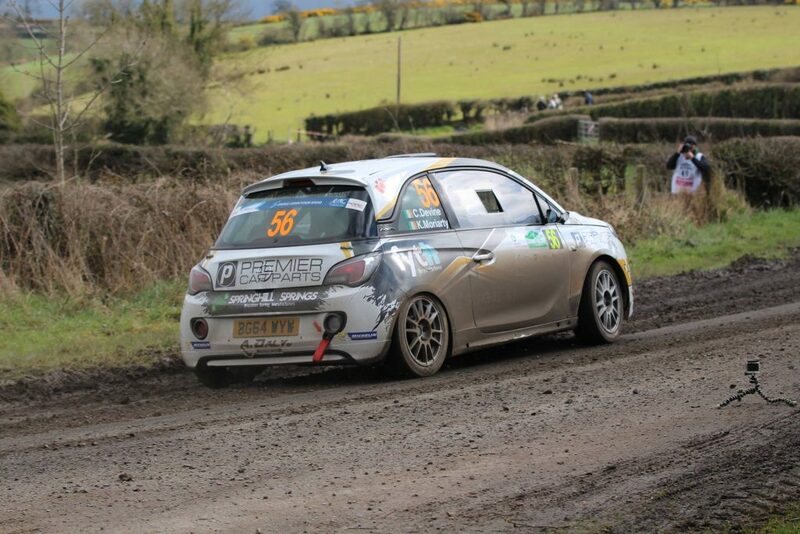 Callum began rallying in 2011, driving a Citroen C2 in the Junior section of the Donegal International Rally. Two years later, he scored a class win in the same event, followed by overall victory in the Junior section of the Cork 20 International in October 2013. Last year, Callum changed to the Opel Adam and took class wins in the Killarney Rally of the Lakes and Ulster Internationals, finishing in the top ten overall each time. He is contesting the Irish Tarmac Rally Championship this year, and has also registered for the British series, planning on tackling one or two gravel rounds. He also hopes to contest an event in continental Europe, possibly Belgium’s Ypres Rally. He would like to progress as far as possible in his rallying career, with the intention of targeting the European Rally Championship. Callum works in his father’s building business. His principal sponsors are Premier Car Parts (Dungiven), FYTH (Derry), Springhill Springs (Newry) and A. Daly Groundwork (Dungiven). Five bi-monthly winners are selected from January-February, through to September-October, joined by the winner of the Junior Championship in the Triton Showers National series, the winner of the Junior category in the Valvoline National Forestry Championship, and a wildcard selection, as the award finalists.